Kristen Hutson’s newly released “Little Max Big Gift” is an uplifting story about a dog who is used by God even though he feels that he is too small and ugly to be loved. 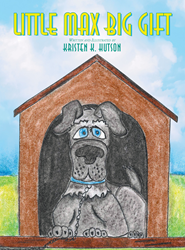 “Little Max Big Gift” from Christian Faith Publishing author Kristen Hutson is a moving story about Max, a dog that once had no name, who feels lonely and unloved by his previous owner, praying to the Lord in an old barn that somebody would love him. “Little Max Big Gift”: an encouraging story inspired from the truth that no one is too small for God to use for his kingdom. “Little Max Big Gift” is the creation of published author, Kristen Hutson, an animal lover from San Dimas, California. Hutson shares, “The pup was so tired. He did not even notice the small house in the next meadow. He could not resist the idea of a nice warm place to curl up and sleep for days. In the barn, he found a stall with a bed of hay. As his eyes began to close, the pup prayed that God would let him be loved. Published by Christian Faith Publishing, Kristen Hutson’s new book comforts people who think they are not significant enough to be loved, by highlighting that Jesus became a miracle and gift to mankind even thought He was just a small baby. God sees through all imperfections. Hutson is able to wonderfully communicate to this book’s readers that it is up to a person to let God use him or her for great things—breakthroughs are coming as long as one chooses not to give up. View a synopsis of “Little Max Big Gift” on YouTube. Consumers can purchase “Little Max Big Gift” at traditional brick & mortar bookstores, or online at Amazon.com, Apple iTunes store, Kobo or Barnes and Noble. For additional information or inquiries about “Little Max Big Gift”, contact the Christian Faith Publishing media department at 866-554-0919.